PPP leader Shabbir Bijarani has become the first winner of the 2018 General Elections. 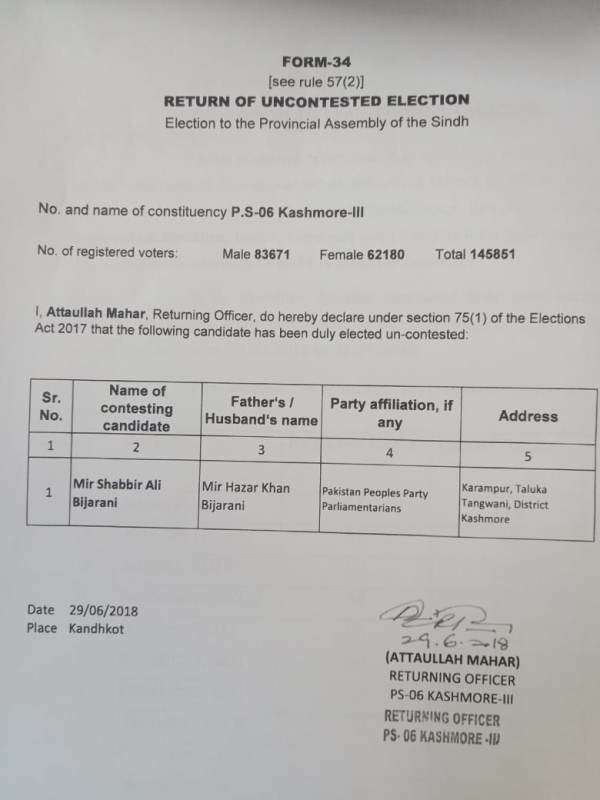 The returning officer has issued a notification declaring Bijarani the unopposed winner from PS-6 Kashmore. Bijarani, who was contesting on the PPP’s ticket, approached the PML-F led Grand Democratic Alliance (GDA) and asked them to withdraw their candidate in his favor as he is ready to join the GDA. He then held a press conference with the GDA leadership and announced that he’s parting ways with PPP. However, soon after the deadline for submitting nomination papers passed, Bijarani went back to the PPP. According to sources, in a meeting with former president Asif Ali Zardari and PPP chairperson Bilawal Bhutto Zardari, Bijarani demanded that he be made a provincial minister. On receiving assurances from the PPP leadership, Bijarani rejoined PPP. “He deceived us and this will hurt his own credibility,” PML-F leader Nusrat Sehar Abbasi told SAMAA TV.